Some parents are fuming over the school system’s decision to charge them for damage to school-issued laptops and tablets this year, arguing that officials shouldn’t pass along the costs of a mandatory program for students. The School Board agreed to a policy change ahead of this school year, stipulating that parents could be charged if officials see any “intentional or negligent” damage to a student’s device. 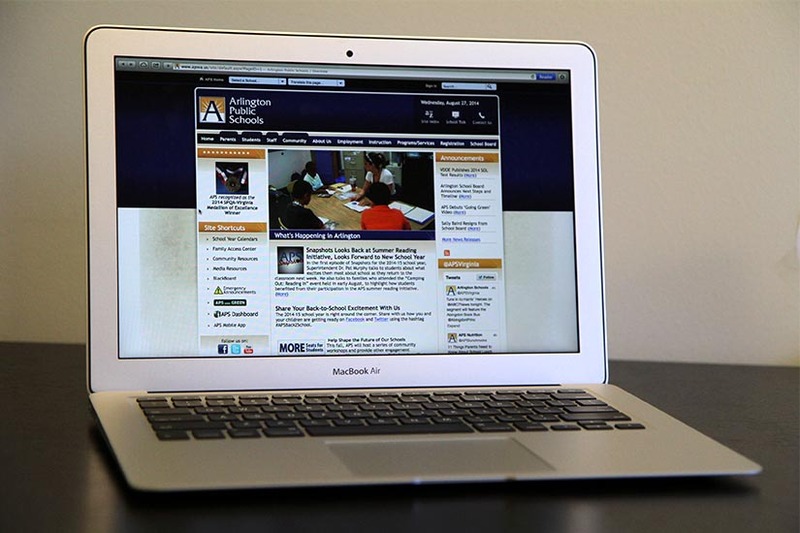 All county elementary and middle school students are currently issued iPads, while high schoolers receive MacBook laptops, as part of the “1:1 device” program the school system first kicked off in 2014. Arlington Public Schools still takes responsibility for “routine maintenance or standard repairs” to school-owned devices, under the terms of its “acceptable use” policy. But the school system does reserve the right to charge parents hundreds of dollars for substantial repairs, or replace a lost device. APS spokesman Frank Bellavia points out that the Board approved such a change back when it was still setting a new budget back in May, in order to “reduce the number of devices being damaged.” The issue has bubbled up now, however, largely thanks to an email from the Yorktown Parent Teacher Association sent out Monday (Dec. 3) laying out the exact cost of repairs. Werchowsky says many parents were completely unaware of the size of these fees until that email went out (though they are posted on the APS website), and they felt a bit of sticker shock. A “complete replacement” of laptop could cost anywhere from $634 to $734, for instance, while an iPad would cost a family $279. Yet Bellavia notes that only 3 percent of all the school system’s devices are lost, stolen or damaged each year — and even then, “the most common occurrence” is a lost charger. For iPads, replacements for those cost $27: for MacBooks, it’s $53. Bellavia adds that APS is “self-insured,” so the school system is only charging parents “the actual costs APS pays to have the repairs made.” Given the tight budgets the school system has been facing recently, officials are particularly eager to find ways to defray any costs they can. “The self-insurance covers the costs to repair accidental damage and situations where the families are unable to pay the full cost of the repair,” Bellavia wrote in an email. But Werchowsky and many of her fellow parents argue that any fee is too high, considering that they harbor serious concerns about using the devices in the first place, making the potential costs all the more frustrating. Some Arlington parents have managed to collect hundreds of signatures on a petition urging APS to to cut back on how often young students are exposed to the devices — the Board itself has even considered moving to a “2:1” or “4:1” device policy for elementary students, as a strategy to control costs and reduce screen time for younger kids. Yet Bellavia notes that concerned parents do have some options, even if the devices will remain a key component of APS curricula moving forward.